VIENNA COOKING CLASSES IN AUSTRIAS LARGEST NEWS PAPER! Sooo cool! 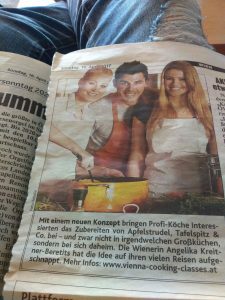 The Vienna Cooking Class project had an appearance in Austrias very largest newspaper, the “Kronen Zeitung”. This makes me so proud! Previous Previous post: VIENNA COOKING CLASSES ON THE RADIO! Next Next post: WANTED: HOBBYKÖCHE IN WIEN FÜR DIE LEITUNG VON KOCHKURSEN!